The most colorful dress yet! Sized for a 3-4 year old (or older), roomy gathered and pleated skirt joins busy bodice that’s ruffled at armholes and neck edge. 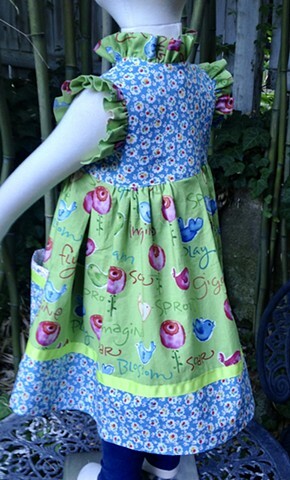 Lime green grosgrain defines the 2-pattern skirt, yet a third print is on the inside and pocket trim. Measures 26” at the tightest part (waist) and 21” shoulder to hem length. Buttons down the front for independent dressing, fabrics are top-of-the-line new and details are many. $110, totally washable, made by the designer herself and shipped free to any address in the U.S. #246.